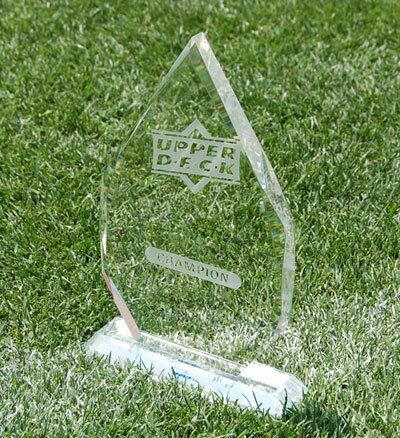 So there's been a decent amount of buzz about these Upper Deck Social Media Awards. Chris and I are honored to have been nominated for Best Blog. When we first started this thing we weren't out to win any awards, just the hearts and time of passionate baseball fans like yourself. We thought we were on to something when we first received a piece of mail: two baseball cards sent to us from a fan. It's always fun to get mail, especially when its not a bill. But opening up that mail box and seeing a yellow padded envelope or a stamped letter is even better. And when we opened it up and there were baseball cards inside...we flipped! We love baseball, and we love baseball cards. For us, its not always about finding the most expensive card or collecting the whole set. We don't even know which cards are the most expensive. We geek out over opening a pack and making your day by mailing you the cards you love. We know what it feels like, don't act like it's no big deal. Chris almost wet himself the first time we got a card in the mail. If we win, all the cards are going to you. The autographed football is going to get auctioned to charity. Even if you don't vote for us, thanks for tuning in. Check out a video. Request a card. We'd love for you to open your mailbox next week and see an envelope with a stamp and some handwriting on it, and a small piece of cardboard heaven inside. That's assuming you aren't at the ballpark, because next week is Baseball Season!